Springwell Lock No 83 is a minor waterways place minor waterways place place on the waterways major waterways place village town city on the Grand Union Canal (Grand Junction Canal - Main Line - Gayton to Brentford) between Batchworth Junction (Junction with Grand Union (Rickmansworth Branch). Rickmansworth Town Centre, half a mile north.) (1 mile and 3¾ furlongs and 1 lock to the east) and Troy Junction Towpath Bridge No 177A (Junction with the private Troy Branch) (1 mile and 3½ furlongs and 1 lock to the south). 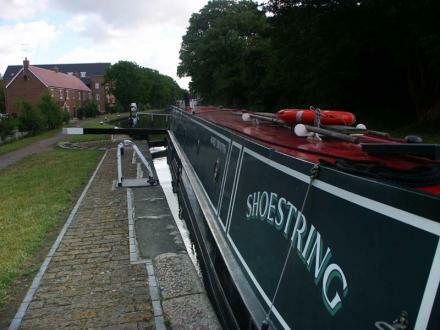 The nearest place in the direction of Batchworth Junction is Springwell Lock Long Term Moorings (Permit holders only); 2 furlongs away. The nearest place in the direction of Troy Junction Towpath Bridge No 177A is Springwell Lane Bridge No 176; a few yards away. 166 Uxbridge Road, Rickmansworth, WD3 8BQ — 1163 yards to the north. Rickmansworth — 1355 yards to the north. 42 Uxbridge Rd, Rickmansworth, WD3 7AR — 1080 yards to the north. Rickmansworth — 1331 yards to the north. Middleton Road, Mill End,, Rickmansworth, WD3 8JF — 1574 yards to the north. 15 Moneyhill Parade, Uxbridge Road, Rickmansworth, WD3 7BE — 1471 yards to the northeast. 131a Uxbridge Road, Moneyhill Parade, Rickmansworth, WD37DN — 1539 yards to the northeast. Rickmansworth — 1633 yards to the northeast. Springwell Lane, Harefield, UB9 6PG — 350 yards to the southeast. Maple Cross, Rickmansworth, WD3 9YZ — 1272 yards to the west. Church Lane, Rickmansworth, WD3 8HD — 1377 yards to the north. Branlea Hall & St Peters Church Hall, Rickmansworth, WD3 — 1229 yards to the north. 14 Ridge House, Rickmansworth, WD3 8UE — 50 yards to the southwest. 151a Uxbridge Road, Rickmansworth, WD37DW — 1617 yards to the northeast. Longcroft Rd, Rickmansworth, WD39TJ — 1415 yards to the west. Springwell Lane, Rickmansworth, WD3 8UW — 215 yards to the south. 41 Mill Way, Rickmansworth, WD3 8QR — 1510 yards to the north. Denham Way, Maple Cross, Rickmansworth, WD3 9 — 1623 yards to the southwest. Shepherds Lane, Rickmansworth, WD3 8JJ — 1376 yards to the north. Hermitage Road, London, N41DF — 925 yards to the west. Rickmansworth — 1006 yards to the west. Church Lane, Rickmansworth, WD3 — 1411 yards to the north. Rickmansworth — 1516 yards to the northeast. 153-155 Uxbridge Road, Rickmansworth, WD3 7DW — 1474 yards to the northeast. Springwell Lane, Rickmansworth, WD3 1NB — 106 yards to the northeast. Millend, Rickmansworth, WD3 — 1072 yards to the north. Tower Bridge Road, London, SE1 2UP — 1129 yards to the north. 10 Linden Square, London, UB96 — 1374 yards to the south. London — 928 yards to the west. Rickmansworth, WD3 8 — 1374 yards to the north. Unit 3 Old Quarry Business Park Springwell Lane, Rickmansworth, WD3 8UX — 116 yards to the southeast. Rickmansworth, WD3 — 1157 yards to the north. Rickmansworth — 1129 yards to the west. Berry lane, Rickmansworth, WD3 7HQ — 1470 yards to the north. Old Uxbridge Road, West Hyde,, Rickmansworth, WD3 9XP — 1444 yards to the southwest. The Cafe In The Park, Frogmoor Lane, Rickmansworth, WD3 1NB — 1626 yards to the northeast. 159a, Uxbridge Rd, Rickmansworth, WD3 7DW — 1446 yards to the northeast. The Old Mill House, 317 Uxbridge Rd, Mill End, Rickmansworth, WD3 8DS — 1108 yards to the north. 1009 yards to the west.